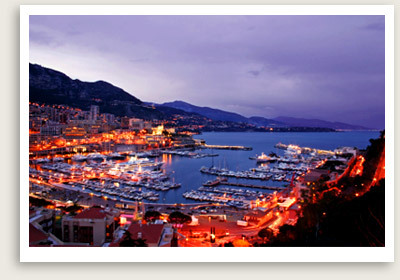 Monaco & Monte Carlo Night Tour Includes: Private transportation and English speaking tour guide, taxes, tolls and parking. Note: Palace only open June to October. Languages: Private tours of Monaco and Monte Carlo are available in English, Chinese – Mandarin, Russian, Portuguese, Dutch. NOTE: Customize this Monaco private tour according to your unique needs. This lovely Monte Carlo and Monaco private tour starts with a late afternoon drive along the seacoast road with its medieval villages, marinas and panoramic viewpoints. You will also drive through the lavish town of Monaco, where you will have a stop at the Palace and have free time to wander around. This Monaco private tour can also be done at night, if interested. You will enjoy an exhilarating tour along the famous Formula One Grand Prix circuit. You will have a stop in Monte Carlo, where you will have free time for dinner and to enjoy the chic atmosphere of Casino Square. If you are feeling lucky, you can try your luck at the tables or slot machines before heading back or simply savor the scene and have dinner or a drink at Cafe des Paris in front of the famous Casino.